Every healer has their own style to healing. Part of that style is their screen real estate and where they put things like health/mana bars, character/target profile, map, and party/raid frames UI. Up until about 3 months ago I was a big fan and user of Healbot unit frames for healing. It is pretty much a plug and play type of add-on. I spent around two-half years healing with it until about 3 months ago when I was introduced to VuhDo. 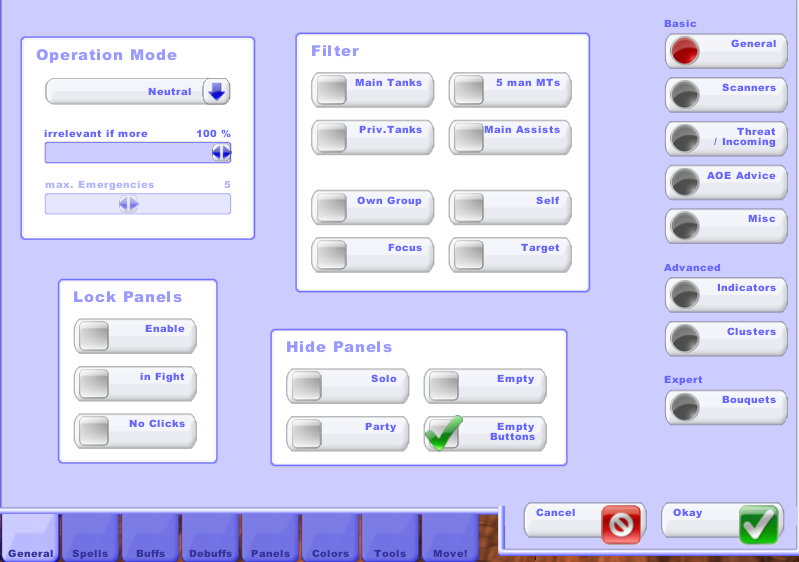 Vuhdo is an add-on that is used to replace the default Blizzard UI in World of Warcraft. Its main purpose is to simplify and streamline the UI for healers in the game. 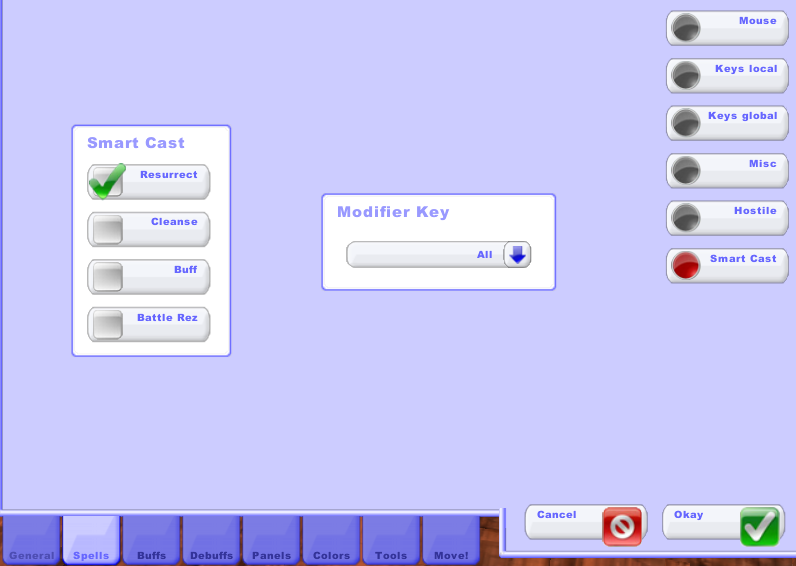 What really drew me to Vuhdo was the customization you could do with it, and how simple it is to set up. 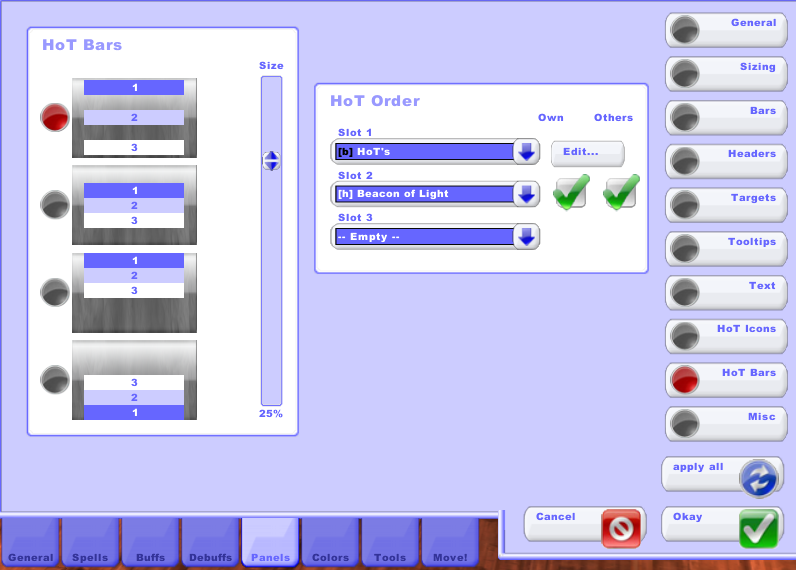 It also has a very clean user interface layout that is appealing to the eye. It offers more customization than Healbot and less complexity than Grid. Vuhdo will require some time spent setting things up, unlike Healbot which is pretty much ready to go out of the box. This post is not meant to be an in-depth instruction on Vuhdo but more of a brief walkthrough so you can get up and running to heal. So if you open up Vuhdo and click on the General Tab, then click General Panel, you will get this screen. Here I left everything alone but checked off Empty Buttons so that when party/raid members left group, there UI bar would disappear and not take up space. You can also enable lock panels here to prevent them from moving during mid fight. 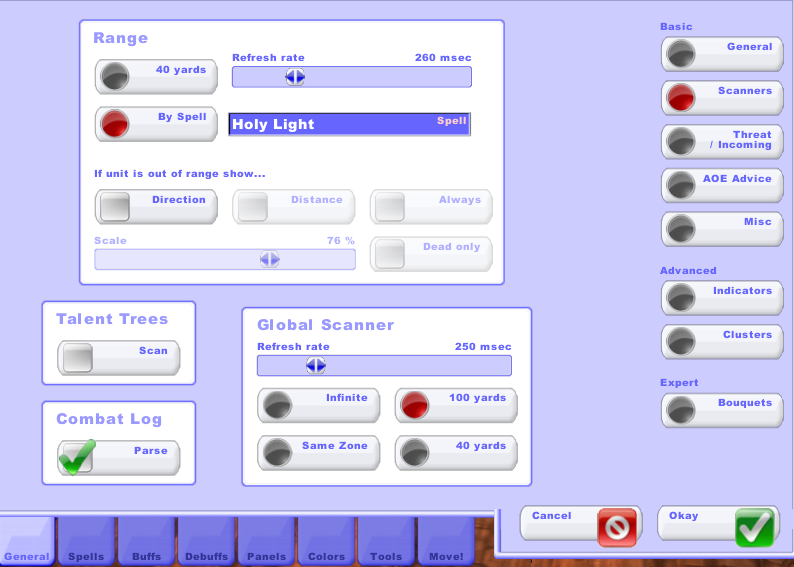 In this panel I de-selected Scan and Direction since I didn’t want an arrow indicating which direction the out of range player(s) were. I selected Parse for combat log reasons(raiding). In order for VuhDo to recognize when players are out of range of my spells, I selected By Spell and added in one of my spells for configuration reasons. In this panel I checked off Own and Others to show incoming heals. In a later tab setting you can setup a specific color for incoming heals. This is really nice, so as not to waste heals on someone receiving a heal, allowing you then to heal another player in need. My incoming heals show up as blue, so as to contrast the green health bar. 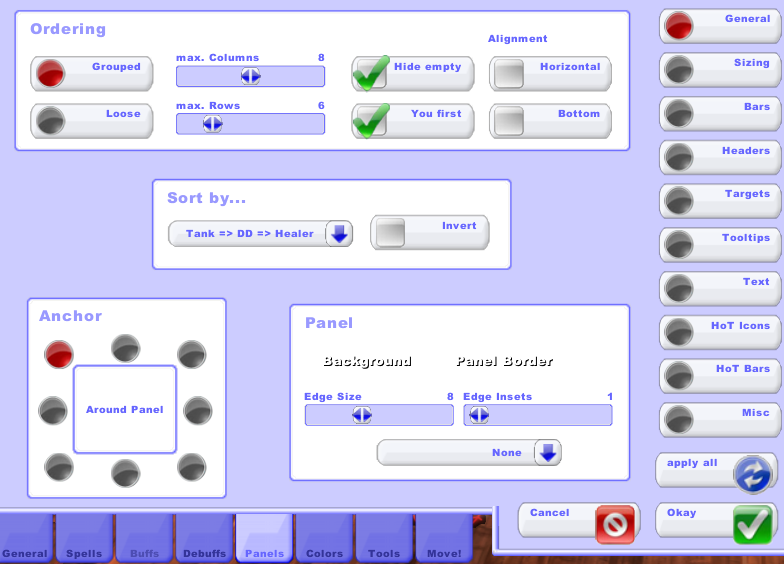 In this panel I really only made changes to the first three by choosing from the drop down window. First one I set up to show aggro indication by highlighting outside edge area with a red box when someone has aggro threat. Second one I setup to indicate who I’ve mouseover’d by highlighting inside edge with white box. I setup the third indicator to place the role icon(Tank, DPS, Heals) in the upper left hand corner of a persons bar. As you can see, there are plenty of indicators to use with multiple choices located in drop down window. 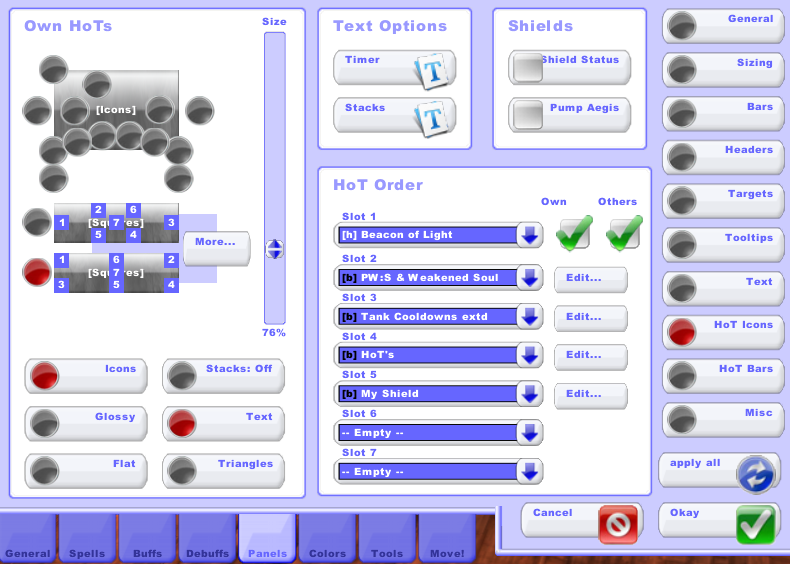 Everything in this panel I left as default except checking Radial, Target and Raid (for Holy Radiance). 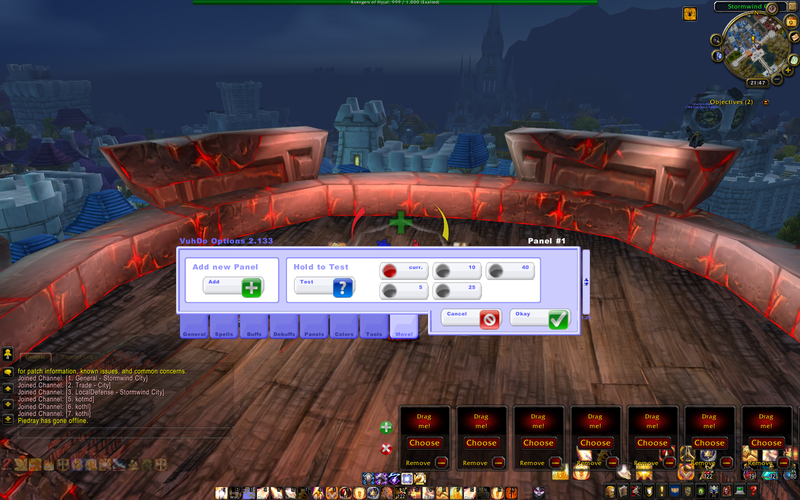 This panel sets up the way your multi target heals show up and affect your UI. Just hover over the selections for a brief description when deciding which ones to use. Pretty much self explanatory. This panel allows you to set up special indicators on your bar. For example, I have an indicator showing up on the bottom right hand corner, for any HoTs cast on that person. Some Bouquets are pre made and others you can design on your own. You can get very customized when setting these up. I have another one indicating which Hand spells are on that person. It can be a lot of fun designing your own!! 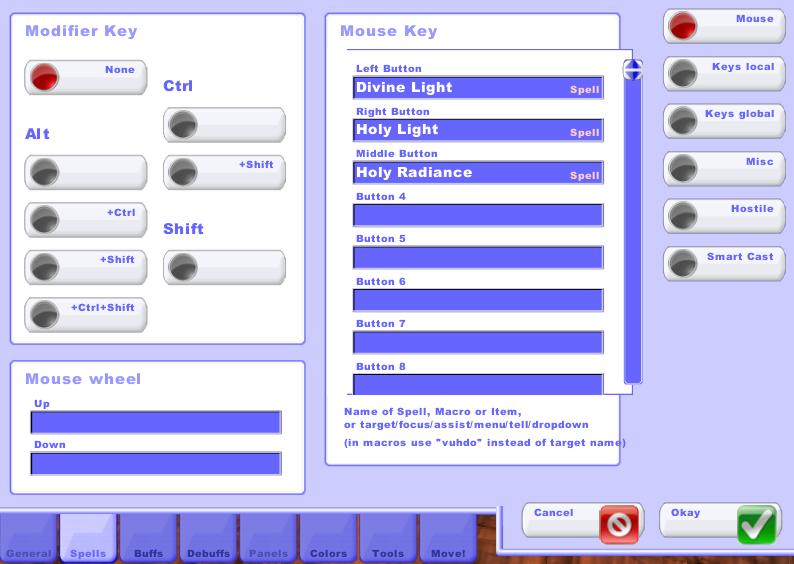 Here is where you can set up which spells you want on your mouse, attaching certain spells to certain buttons. Only thing special here is that when resurrecting, all I have to do is mouseover the dead person, left click and voila. You can set up other Smart Casts for buffs, cleanse and battle rez. The Spells Tab does have Panels which allow you to set up macro’s and key binds, however since I do most of that in game, I leave those areas alone. The Debuffs Tab allows you to configure monitoring of debuffs on your UI. In the Standard Panel, you have options to set up certain monitoring rules. In the Custom Panel you can modify how you view debuffs and add options like stacks and timers. A list of debuffs for monitoring can be found within the drop down menu or you can add them on your own. In the Panels Tab, you really get to customize the look of Vuhdo. General Panel allows you to organize the bars, who you want up top vs bottom, and other customizations which allow you to set up the bars just how you want them. In the Text Panel, just like it says, you can customize the text to just how you like it. 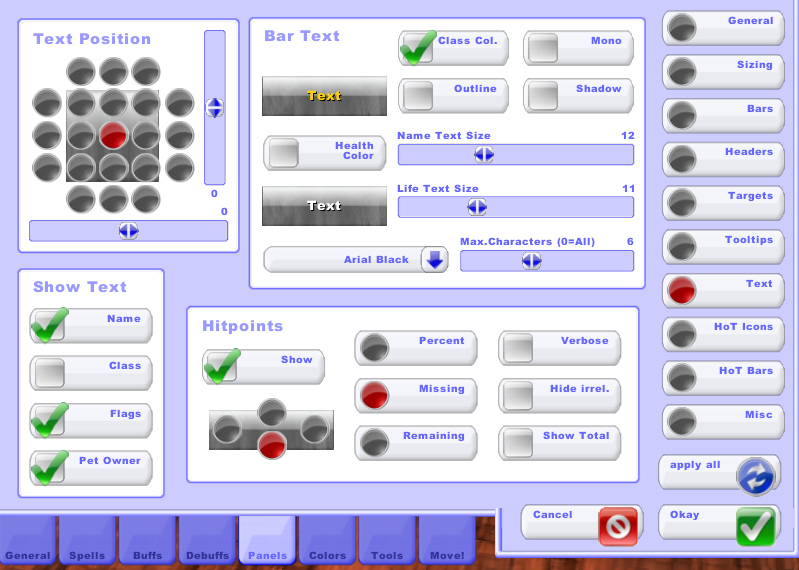 Make the name in class colors, have only so many digits in the name, keep it centered,font size and type, its all here. 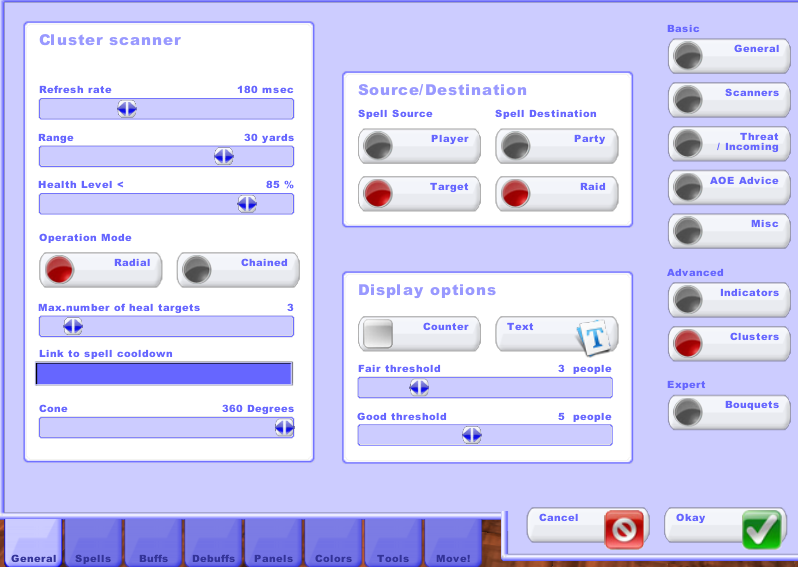 You can also customize the hit points. I prefer hit points missing, so as to help me in determining the right spell to cast. 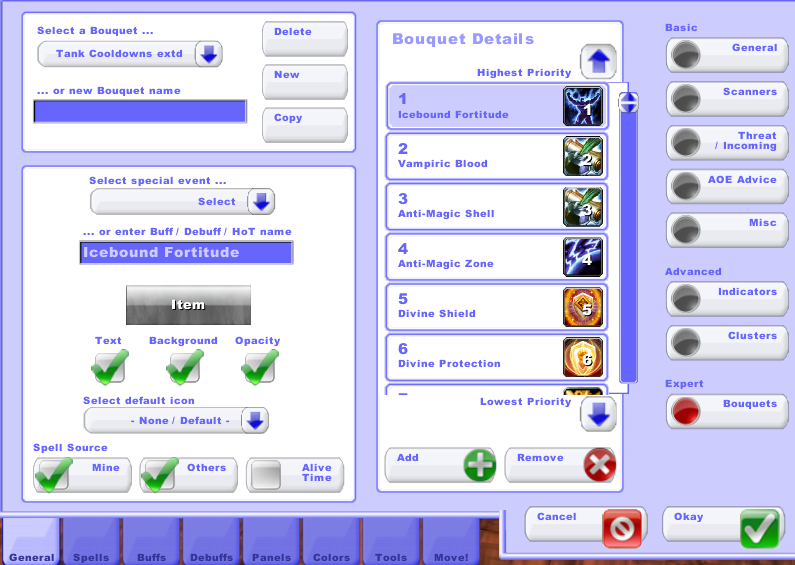 In this panel you can set up the location of all your indicators and bouquets. Vuhdo gives you several options to choose from. You can even decide whether or not you want to use the in game icon or generic icon from Vuhdo. This is a customization that allows you to create bars (thickness can be adjusted) across the health bar for anything that has a timer(Heals,Buffs). As the timer runs down, the bar gets shorter from right to left. As you can see from the picture above, I have set up two, one for my Beacon of Light and another for any HoTs rolling on a person. This Panel located in the Colors Tab allows me to customize the color of certain dubuffs that my Cleanse spell removes. Keep in mind this is class dependent, but very simple to set up, with the check of a box. The Modes Panel lets you do a couple things. 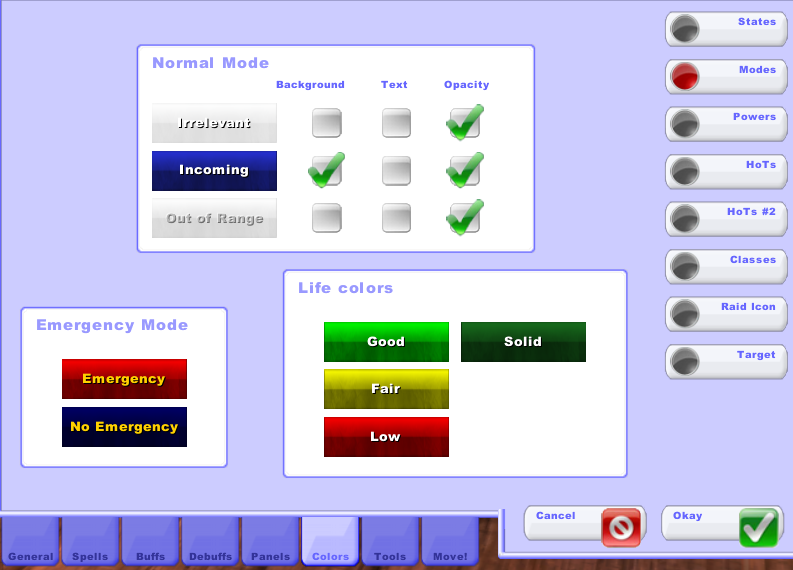 First, I set up my UI bars to change color depending on the persons health status. As you can see, green is good and red means close to death. Second, like I mentioned earlier, I like to show incoming heals. It is here where you can setup what color you wish to have your incoming heals show up as. I have mine coming in as blue so as to contrast with the other states. Incoming heals will show up in the background of the health status. Here is an example of what my health bars look like. I can see which buffs, cooldowns, and HoTs I have on that person as well as a few other indicators. Its all up to you what you want showing. For me Vuhdo really helped in organizing and keeping track of Buffs and Cooldowns which then made my job as healer less stressful. Finding that Healing UI that works best for you whether it be Healbot,Grid, or Vuhdo is very important to every healer thus allowing you to do your job to the best of your ability. I hope that this basic walkthrough was helpful to someone trying to set it up or perhaps convince a few to give it a try. For a more in-depth walkthrough of Vuhdo go here. Would you be at all interested in expanding this topic by healer specific setup? I’ve used it for about 3 years and I’ve been looking for an excuse to write a Druid guide. This post was definitely written from a Holy Paladin PoV. Once you’ve completed your post, perhaps we could link them somehow to expand it. Let me know what you had in mind.